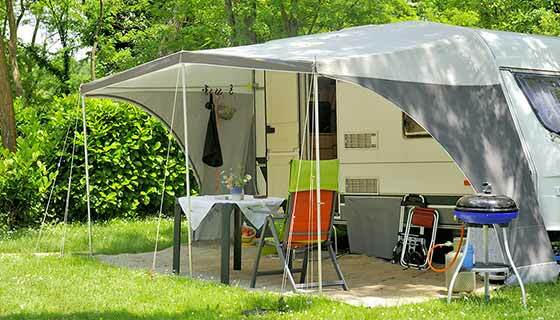 Camping with the luxury of home, that’s possible in one of our fully equiped Safaritents. At your beautiful part of our campsite, you can enjoy your relaxing holiday. You only have to bring your clothes. 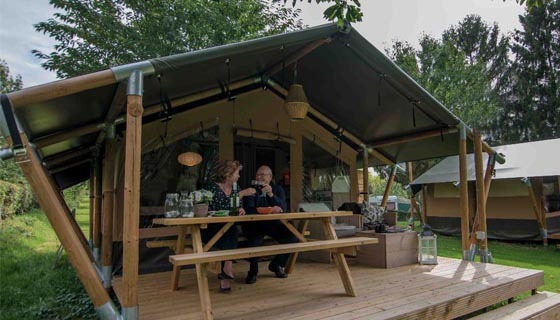 You can call camping in our Safaritents “Glamping”. We tought about everything: tables, chairs, real beds, kitchen equipment, lights, heating and much more. Our Safaritents are fully equiped for 4, 5 or 6 persons. 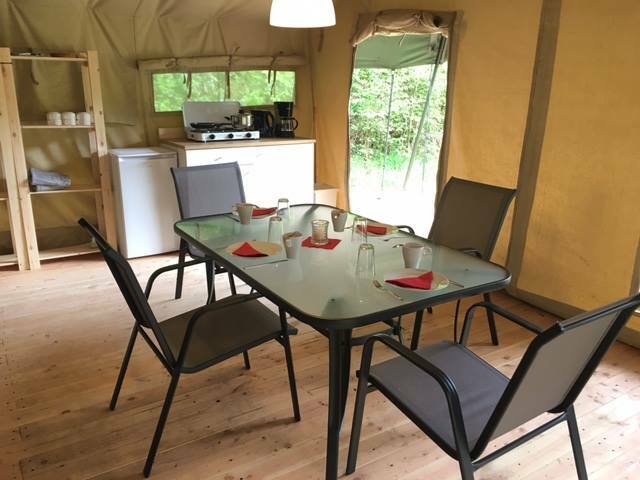 In 2019 are 3 different models of Safaritents available, when you book the smallest tent (ideal for parents with 1 or 2 small children) you’ll receive 10% discount. All tents have basic facilities available like running water, sewer (outside the tent), electricity, lights, heating and wifi. Natuurlijk staan er comfortabele bedden in het slaapgedeelte (een 2-persoons bed en 1-persoonsbedden of stapelbed, allen met kussen en dekbed) en is de woonkamer compleet ingericht met tafel, stoelen, enzovoort. De keuken is voorzien van koelkast, gasfornuis, pannen, servies, bestek, enzovoort. Optioneel is het lakenpakket en een babystoel/bed. Kortom: alles voor een fijne vakantie is aanwezig. Ofcourse we have comfortable beds in the sleeping aera (one 2-persons bed and 1-persons beds or bunk bed, all with pillows and quilts) and the livingroom is equiped with funiture like a table, chairs, etc. The kitchen is equiped with a fridge, stove, pans, dishes and silverware. Everything for a relaxing holiday is available. The only thing you have to bring are your clothes! 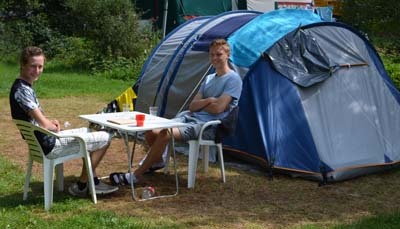 Our tents are less accessible for disabled people due to the fact they are situated at a lawn or have small steps. Also pets are not allowed. Week: Saturday – Saturday, midweek: Monday – Friday, weekend: Friday – Sunday. Arrival after 14:00 hours, departure before 11:00 hours (weekend 17:00 hours). Discounts preseason and afterseason are deducted in the prices above, all other discounts are not applicable. Prices based on 4 persons. When booking the smallest tent (max. 4 pers. ), you’ll get 10% discount. Per 2019 is the end-cleaning included in the price. Reserve without costs your Safaritent! You'll receive a confirmation by e-mail, the reservation will be final after we've received your deposit. Camping without taking everything with you. That's really glamping. They tought about everything: there are even clothes pegs to dry your clothes!